A team of researchers at the Technical University of Munich (TUM) has developed a way to strengthen DNA nanostructures for improved survival under harsh environmental conditions. In their paper published in the journal Science Advances, the group describes their technique and why they believe it will be useful. Six years ago, a team at TUM led by Hendrik Dietz developed a technique to use DNA to build nanostructures. The resulting nanostructures were found to be self-assembling with atomic precision. After reducing the time it took for the structures to assemble, the technique made its way into industry—such nanostructues now provide a means for creating arrays of quantum dots that are used in display devices and for Raman spectroscopy applications. In this new work, another team led by Dietz has improved on the technique, this time making the nanostructures more robust. One of the limiting factors for using DNA nanostructures was their tendency to unravel when exposed to high temperatures. To overcome this problem, the researchers modified their technique to form more covalent bonds after the nanostructures are created. In a surprising twist, the team found that applying UV radiation after the self-assembly period formed more bonds. The bonds, in turn, prevent the double helices from unwinding. The researchers explain that the technique works because the radiation causes adjacent T-bases to react with one another. In testing nanostructures made using the new technique, the researchers found they were able to withstand temperatures up to 90° C. They note that the additional bonds also made the nanostructures more able to withstand environments such as those inside a living organism. They noted, too, that irradiating the nanostructures also removed defects. The researchers claim that they have now removed the final hurdle preventing widespread use of DNA nanostructures and expect them to have wide variety of applications. They note that the nanostructures are ideally suited for biomedical applications. They also point out that they are not finished with their research—their next challenge will be to try to understand what happens when the nanostructures are introduced into living organisms. Bottom-up fabrication of custom nanostructures using the methods of DNA nanotechnology has great potential for applications in many areas of science and technology. One obstacle to applications concerns the constrained environmental conditions at which DNA objects retain their structure. We present a general, site-selective, and scalable method for creating additional covalent bonds that increase the structural stability of DNA nanostructures. 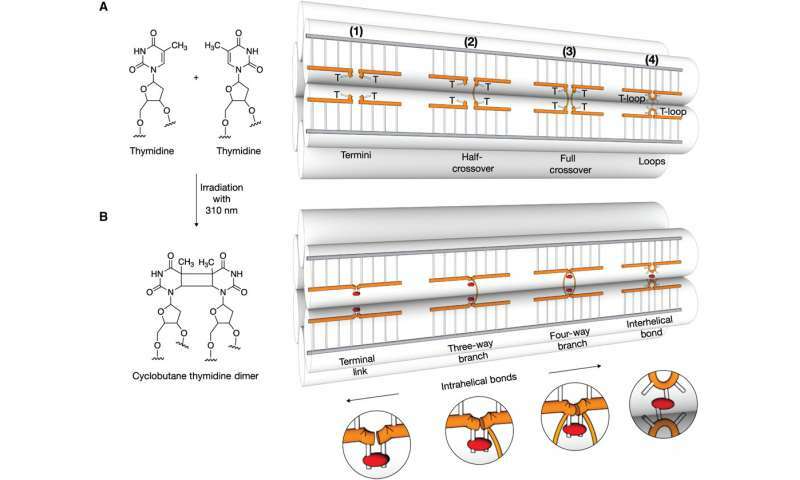 Placement of thymidines in close proximity within DNA nanostructures allows the rational creation of sites for covalent cyclobutane pyrimidine dimer (CPD) bonds induced via ultraviolet irradiation. The additional covalent bonds may be used in a sequence-programmable fashion to link free strand termini, to bridge strand breaks at crossover sites, and to create additional interhelical connections. Thus designed multilayer DNA origami objects can remain stable at temperatures up to 90°C and in pure double-distilled water with no additional cations present. In addition, these objects show enhanced resistance against nuclease activity. Cryo–electron microscopy (cryo-EM) structural analysis of non–cross-linked and cross-linked objects indicated that the global shape and the internal network of crossovers are preserved after irradiation. A cryo-EM map of a CPD-stabilized multilayer DNA origami object determined at physiological ionic strength reveals a substantial swelling behavior, presumably caused by repulsive electrostatic forces that, without covalent stabilization, would cause disassembly at low ionic strength. Our method opens new avenues for applications of DNA nanostructures in a wider range of conditions.